Janice Lenore Crilly was born on July 20, 1928, in Lincoln, Nebraska, the daughter of Howard M. Crilly, a newspaper publisher, and Lenore N. (Hazel) Crilly. Janice Crilly and her brother, Donn, were raised in Superior, Nebraska, where her father ran the local newspaper, The Superior Express, beginning in the mid–1930s.2 In 1948, she graduated with an Associate Fine Arts degree from William Woods College in Fulton, Missouri, and with a B.A. in communications from the University of Nebraska in 1951. Following graduation, she worked in advertising and public relations. Crilly married Louis “Dutch” Meyers, who eventually became a Kansas City television station executive, and they raised a daughter and son, Valerie and Philip. Jan Meyers’s career in Kansas GOP politics began in 1966, when she served as Overland Park’s chairwoman for Edward Lawrence “Larry” Winn, Jr.’s campaign for a U.S. House seat representing suburban Kansas City. Two years later, she was district co–chair for the first of Senator Robert Dole’s string of five successful Senate races. In 1974, Meyers chaired Republican Bob Bennett’s gubernatorial campaign in Johnson County. From 1967 to 1972, she served as a member of the Overland Park City Council, presiding for two years. In 1972, Meyers won election to the Kansas state senate and served there for the next 12 years, rising to chair the public health and welfare committee as well as the local government committee. In 1978, Meyers entered the GOP primary for one of Kansas’s seats in the U.S. Senate but garnered only 10 percent of the vote and finished fourth in a race eventually won by Republican Nancy Kassebaum. When Congresswoman Meyers arrived in the House, she was determined to work her way into a position of power through traditional routes. She sought a seat on high–profile committees such as Ways and Means and Appropriations, but was unable to secure a spot on either. Instead, she was appointed to the Committee on Science and Technology, the Committee on Small Business, and the Select Committee on Aging. In the 100th Congress (1987–1989), she transferred from Science and Technology to the more prestigious Foreign Affairs Committee. Meyers declined to run for re–election in 1996, noting that she wanted to spend more time with her family. “There are other things in life I want to do, and being a Member of Congress, if you take the job seriously, simply does not leave time,” Meyers told the press.16 She also said she believed that Members of Congress should serve no more than 10 to 14 years.17 Meyers returned to Overland Park, Kansas, where she joined foundation boards for a local library and a community college. 1Amy Kenna, “No Business Like Small Business: Meyers Reflects on Being One of Only Four Women in History to Chair a House Panel,” 8 March 2001, Roll Call: 38. 3Politics in America, 1990 (Washington, D.C.: Congressional Quarterly Inc., 1989): 566–567. 6“Janice Lenore Meyers,” Associated Press Candidate Biographies, 1996. 8Karen Foerstel, Biographical Dictionary of Congressional Women (Westport, CT: Greenwood Publishers, 1999): 185–186. 9Congressional Record, House, 102nd Cong. 2nd sess. (12 May 1992): 3138. 11Congressional Record, Senate, 104th Cong., 1st sess. (5 December 1995): 18013. 12Politics in America, 1994 (Washington, D.C.: Congressional Quarterly Inc., 1993): 600; Politics in America, 1990: 566. 13Congressional Record, House, 102nd Cong., 2nd sess. (2 April 1992): 2273. 14Politics in America, 1990 : 566. 15Congressional Record, House, 103rd Cong., 2nd sess. (26 April 1994): 2759–2760. 16“Kansas Congresswoman Won’t Run Again,” 29 November 1995, New York Times: B14. 17“Kansas Lawmaker to Retire,” 29 November 1995, Washington Post: A15. Papers: 1960s-2000s, 268.25 linear feet. The collection of former Congresswoman Jan Meyers includes campaign files and election documentation; publicity and public relations materials; awards, plaques, paperweights, and other memorabilia; polling information; information regarding other politicians in the Republican Party; newspaper clippings; correspondence; and subject files, amongst other records. Subject files provide an overview of some of the issues of concern to Meyers's constituency and coming before the legislatures in which she served, both locally to Kansas and nationally to the United States. The collection includes records from Meyers's Overland Park; Kansas City, Missouri Federal Building; and Washington, D.C. offices. 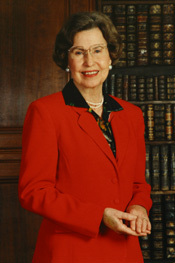 Much of the material dates from the 1980s and 1990s when Meyers served with the United States House of Representatives. A finding aid is available in the repository and online. Videoreel: 1994, 2 commercials on 1 videoreel. The commercials were used during Jan Meyers's 1994 campaign for U.S. Congress in District 3 of Kansas, Republican Party. "Jan L. Meyers" in Women in Congress, 1917-2006. Prepared under the direction of the Committee on House Administration by the Office of History & Preservation, U.S. House of Representatives. Washington: Government Printing Office, 2006.